The Community Sportsfield in Tullycross was too soft and wet at the latter end of the year for hurling practice so we journeyed down to Glassilluan Beach for early morning preparatory sessions in advance of our first competitive League outing at Division Three level. Training on sand is horrendous because the sliotar doesn’t bounce like it’s meant to bounce and your feet don’t run like they’re meant to run in a match, yet, in a strange sort of way we managed to turn these adversarial circumstances into a huge motivational factor. We impressed upon the lads that they’d be liberated and transformed in their hurling endeavours once they got out on the grass, and that their superior reserves of strength, stamina and endurance would ultimately give them a decided advantage when push came to shove. The advent of the new pitch at the foot of Diamond Hill represents tremendous progress and positive natural evolution within the life of the college but in hindsight we wouldn’t swap all those 7 am sand sessions down the north side for the world because they became an integral part of the whole romance of the story. Due to the fact that the training infrastructure was so poor, we concentrated mostly on drills with the main emphasis being on skills development. We also threw in a bit of backs and forwards from time to time, and to their eternal credit the lads never grumbled or complained. We never had to chase them up to attend training as they were all self driven, and before long an incredible team spirit became self ingrained within the squad. Back row (L to R): Seán Garvey, Kieran Divilly, James Carty, Des Lacey, Patrick Carty, David Farrell, Damien Ryan, Joe Moore. Front row (L to R): John Finn, John O’Boyle, Donagh Hassett, Shane Broderick, Larry Headd, Sean Torpey, Joe Sweeney, Stephen Behan, Paul Leamy, Shane Coen (Captain). Our maiden voyage into the world of university hurling was a trip to Cratloe in County Clare for a match against Limerick IT’s B team. Before the match we used a little bit of reverse psychology to get the players into the right frame of mind. The pre-match pep-talk went something along the lines of “Look lads, these guys here, they’re only the second string from Limerick whereas ye’re the elite of Letterfrack. Now, go out there and show them how it’s done.” Our words of wisdom were well received and the lads served up an honest, totally committed and whole hearted performance. We lost the match but put up a very respectable score and weren’t hammered, by any means. On the bus journey home, the mood was upbeat, there was a great sense of camaraderie and probably an even greater sense of accomplishment, at having officially arrived into the Third Level All Ireland Series. In the intervening years, our hurling club in GMIT Letterfrack has come to very closely resemble that of a traditional parish club, and if anything the bond is even tighter because the player age profile is basically the same. We both attended other Third Level institutions after our Leaving Cert before we came to Letterfrack and we can honestly say that the latter is a very different experience in a hugely positive way. 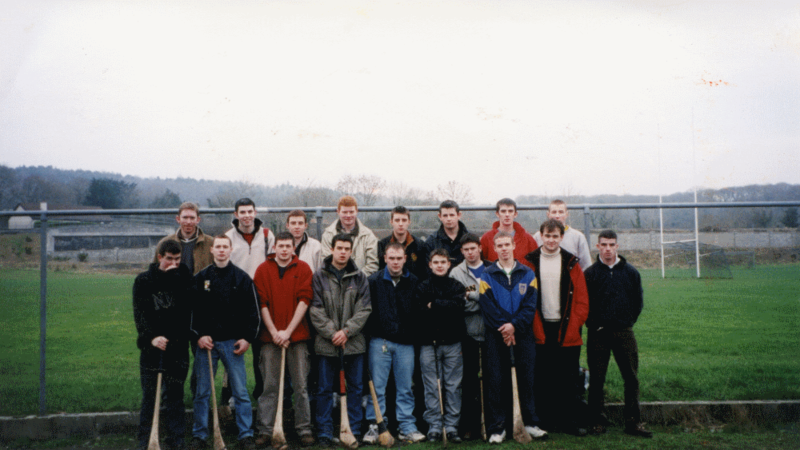 The communal love of wood, the countless hours spent working, studying, socialising and training together in such a small, intimate setting has served to create a hurling fraternity within the college that prides itself on loyalty, friendship and a never-say-die attitude on the field of play. The players know each other inside out and they have always used this to their advantage in the heat of battle, particularly against higher profile opponents who sometimes display an ill-conceived attitude of arrogance and condescension towards them. In short, the Letterfrack lads know they have the brotherhood. It’s a special quality that sets them apart and gives them the upper hand psychologically, because more often than not, it has the effect of planting seeds of self doubt in the minds of their more illustrious opponents. Remembered by Paul Leamy and Sean Garvey and written by Paul Gannon. Paul Leamy is a permanent resident of the townland of Dawros, in the Parish of Letterfrack-Ballinakill. Sean Garvey is a permanent resident of the townland of Derryinver, on the Renvyle Peninsula, in the Parish of Letterfrack-Ballinakill.